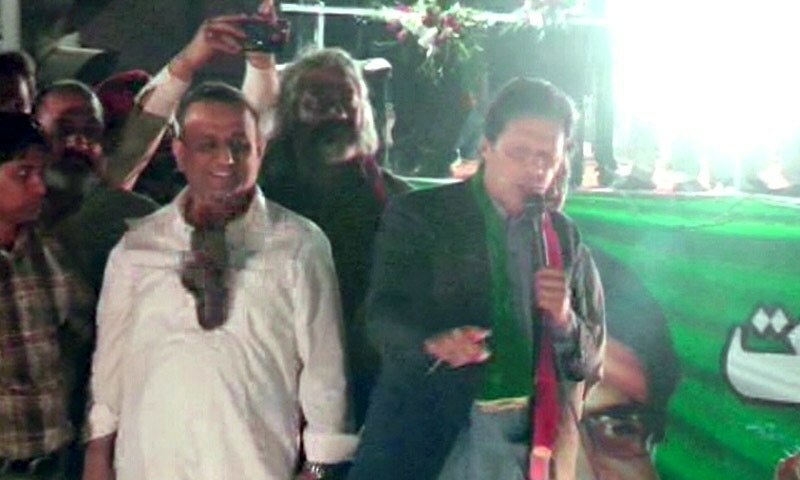 A shoe hurled at Pakistan Tehreek-i-Insaf (PTI) leaders during a rally in Gujrat on Tuesday hit party leader Aleem Khan. Although the shoe hit Aleem, it wasn’t immediately clear who was the target of the attack as he was standing right next to PTI Chairman Imran Khan. The incident — the third such attack on politicians in the span of a week — took place during a public gathering of PTI workers in Gujrat. As Imran Khan was addressing the crowd atop a vehicle in the evening, a shoe came flying and hit Aleem, who was standing beside him. The shoe hit the PTI leader squarely in the chest, although with lesser force than was perhaps intended. This was evident from the fact that Aleem, after fleetingly being shocked, brushed off his chest and continued to smile.